When Pope Francis celebrated Mass at the Vatican in early March, he criticized Christians who self-righteously boast about fasting and feel superior to others. Focusing on the day’s first reading from the beginning of Isaiah 58, the pope said the corporal works of mercy are the kind of fasting God wants most. “When you share your bread with someone who is hungry, invite into your home someone who doesn’t have one or is a migrant, when you look for clothing for someone who is without — when you focus on that, you are truly fasting,” he said. Sister Mary Cronin, Catholic Charities’ Prison Ministry coordinator, regularly visits the men and women who are behind bars. During a visit to one of the facilities, a social worker told her that there was a great need for these specific clothing items. “Often times, the incarcerated are given a jumpsuit — and nothing to wear under it. So many inmates have no family, friends or money to supply them with these basic and essential clothing items. It’s an affront to their human dignity,” Sister Mary Cronin explained. Her concerns were put at ease when, just a week after the drive was announced, hundreds of donations began piling up. These monetary donations, she explained, are used to purchase the requested items. So when a check was given to Catholic Charities for the drive, another staff member, Sister Mary Matthew Labunski, headed to a Walmart. While piling up large stacks of underwear and socks at the register, the cashier, she said, asked about them. When Sister Mary Matthew Labunski told her about the drive, the cashier looked at her, paused and said “They never did that for me” before continuing to scan the items. 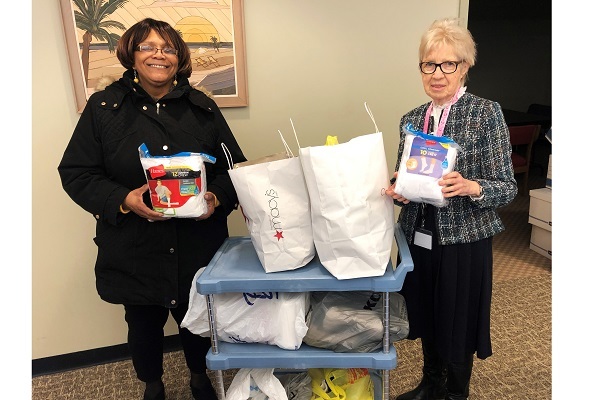 As the underwear and sock drive came to a close, another began — the Seventh Annual Diocesan FaithFULL Food Drive. Each year, the drive aims to restock local food pantries across Southern New Jersey, including those at Catholic Charities, during the months following the holidays when the shelves tend to be empty. Across the diocese, parishes and schools have been collecting non-perishable items which will be distributed to those who are food-insecure, meaning that they do not know where their next meal will come from. In South Jersey, that number is one in six people (and one in five children). All items will be collected this Sunday, April 7.